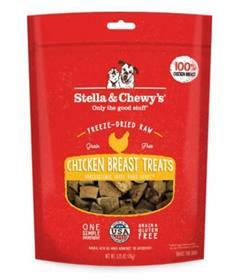 Give your dog the ultimate reward with Stella & Chewy's Chicken Breast Freeze-Dried Raw treats. These single-ingredient snacks are made from chicken breast and nothing else for a bite that’s rich in protein and essential amino acids. The grain-free and gluten-free morsels are the perfect option for pets with food sensitivities and limited-ingredient diets. Each raw snack can help support your pal’s healthy digestion, strong teeth and gums, vibrant skin and coat, plus their stamina and vitality. To top it all off, they’re made in the USA without the use of artificial ingredients for a treat you can trust.